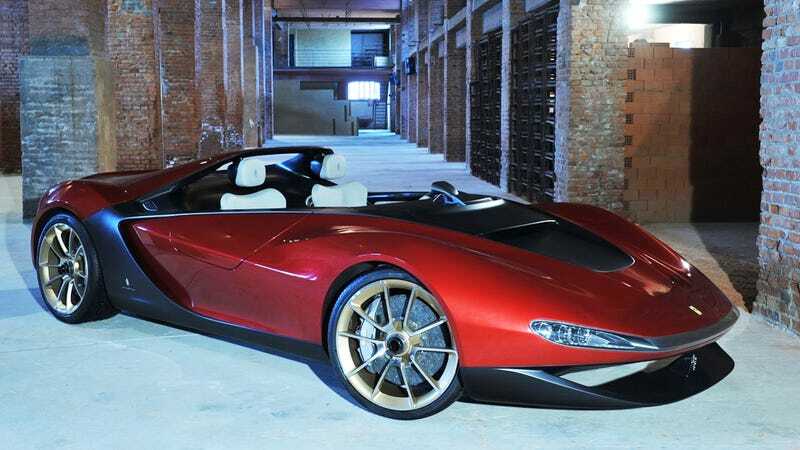 Forget the LaFerrari – the Pininfarina Sergio is be the best Ferrari you'll see today. In short, it's a custom car built on top of a Ferrari 458 Spider. It's that simple, and it's simplicity that makes it great. Now, I like the new LaFerrari plenty. I like how it looks, in spite of some protests that it has cookie-cutter design. I like its hybrid drivetrain, because there's little left to prove with a big naturally-aspirated V12. I like that it will drift. But this Pininfarina tugs at my heartstrings and I adore it. What you get with this car is a thoroughly-thrashable Ferrari 458 Spider chassis, complete with its mid-mounted 562 horsepower V8 and its seven-speed dual clutch gearbox. While Pininfarina didn’t change the wheelbase or the track width of the car, they did add a roll bar at the back and a fixed rear spoiler, too. The real change is, of course, in the body, which manages to shave 150 kilos (about 331 pounds) from the base 458. Somehow, though the total weight of the car only drops from 3,042 lbs to 2,822 lbs, possibly because the Pininfarina version gets swan-style doors. The 0-62 time is down to 3.4 seconds and top speed is listed at a very blustery 199mph. The Sergio is named after the former chairman of the legendary carrozzeria, who passed away last year. It’s a fitting tribute to the man, with clean, smooth, and very classic 1960s styling. If it was scaled down and put on vintage wheels, you might mistake this for a Stanguellini or some prototype OSCA. We think it’s gorgeous, and if you happen to be fabulously wealthy, Pininfarina will build you one upon request.